Funbox is a show from Anya Scott-Rodgers, Gary Coupland and Kevin Macleod. Bringing a wealth of experience from their days as performers and writers of The Singing Kettle, they have created a sparkling show for kids of all ages – from nought to 90 – maintaining the balance of traditional singalong songs and brand new compositions, but with a distinctly Scottish flavour. Everyone’s favourite cheeky dog, Bonzo, is up to his usual mischief and there are loads of new friends too, including Fluffy and Flossie, the ever-helpful Funsters. Formed in 2014, Funbox's aim is to take their own brand of family singalong silliness across the length and breadth of Scotland and beyond. 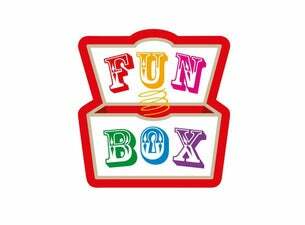 Funbox is a show that the whole family can join in with, filled with madcap characters, music and mirth. Packed with familiar and new songs, everyone can get involved and have a good time. At the heart of every show is the magical but mysterious Funbox, which contains everything you need to sing a song or have an adventure. The only trouble is it will only open up when a special key is found, but those keys have habit of getting lost. Can you help find them?